As part of preparing my session for the Canadian Financial Summit, on how to plan and finance a “medium-budget” wedding, I did a quick pie chart to break down how much we spent on each category. Similar to the One Minute Budget, and percentage-based budgets in general, there are rules of thumb when it comes to wedding budgets. One of the most popular ones is to allocate about 50% of your total budget to food and drink. It’s especially helpful since getting a per-person estimate for food and drink is one of the easiest numbers to find early in the planning process. That can give you a good baseline to start from. If you’re looking at a venue that charges $100 per person, and you’re going to have 100 people, that’s $10,000. If you’re having a typical wedding, that puts your total budget around $20,000 based on these rules. But just like any percentage-based budgeting rule, it’s not perfect. That estimate assumes that you’re including every other category of spending in your wedding budget, from hair to makeup to a dress to invites. So if you’re cutting out some major categories, or scaling way back from what people “typically” spend in others, it can skew your numbers — and give you more money to spend on the parts that really matter to you. So while yes, budgeting rules can help you guesstimate a wedding budget at the beginning of the process, there’s a lot more that needs to happen between your guesstimate and your final spending totals. 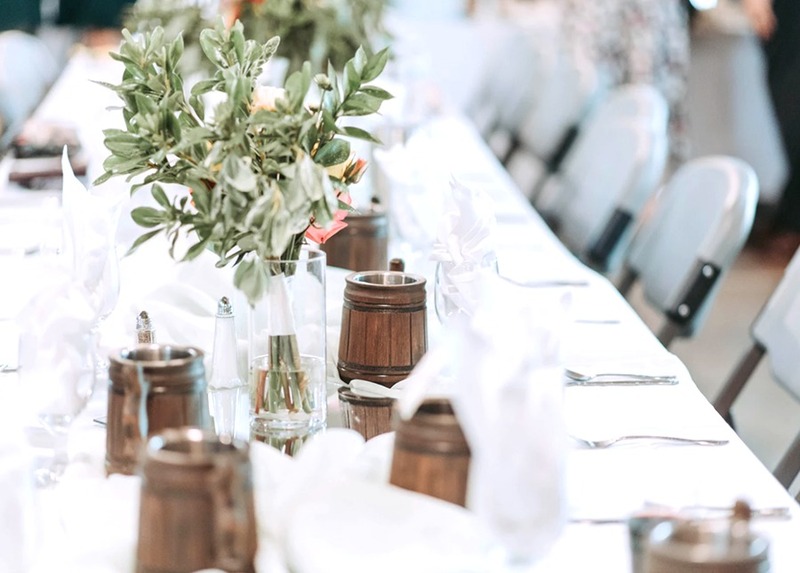 I know, because while sure, food and drink are supposed to be about 50% of your total budget, we ended up spending 74.3% of our total budget on our venue, the food, and the beverages. And if I learned anything from it, it’s that priorities matter. When we first started wedding planning, the very first thing we did was agree on three key priorities. There are a lot of things you can spend money on for a wedding (or in life in general, tbh), but we wanted to agree early on what was most important to both of us. When we made a list of all of the family and friends we wanted to invite (a process in which we were still pretty ruthless, by the way!) we were looking at a list of 90 people. So uh, I guess hosting it in our backyard, which is not 90-person compatible, was out of the question. But having those people at our wedding was our number 1 priority, which is why we started to look into wedding venues around town. As we did, I realized there are two kinds of venues. There are the ones that are a bit more DIY, where you need to bring in multiple vendors to make the space wedding-ready. Then there are the ones that are more traditional venues, that come all set with catering, drinks, cutlery, the whole nine yards. Since priority number 2 was a low-stress event, we erred on the side of an all-inclusive venue. Did it mean we maybe weren’t going to win Pinterest with our wedding photos in a hyper-unique space? Sure, but that wasn’t a priority. And since priority number 3 was to remain debt-free, it meant that to afford our venue and all of the food and drinks, we cut way back on other things like decor, and went without many more traditional elements of a wedding, like paper invites. To make our venue and food spending fit our budget, we scaled way back on other parts of the wedding. We spent a grand total of $40 on a shirt for The Husband (weiiiiiird) to wear, and my dress was a generous gift from my mother. We had friends gift us their DJ-ing skills (playlists on Google Music and a laptop) and officiating the ceremony. While we included thank-you gifts for them in our total budget, it still cost us much less than hiring pros. We fully skipped paper invites, fresh flowers, a videographer, expensive rings, a pro wedding planner, a cake, and tons of other more traditional elements of a wedding. If it wasn’t in service of our three priorities, it was a pretty easy pass when it came to planning. Sure, there were some parts of the budget that weren’t a top-three priority but were still important to us, like photography and pro makeup artist for me, but on the whole, if it was a small thing and not a priority, it got cut pretty quickly. Or just didn’t get brought up because we forgot we were supposed to do it. This isn’t to say that I didn’t have some wedding guilt at some parts in the process about things like skipping paper invites, because I totally did, and often found myself casually browsing Minted until the price tag and exchange rate brought me back to earth. But if you’re clear on your priorities, it makes the hard choices a bit easier to stick to. When I look back at our wedding budget, and our actual spending on the wedding, I don’t regret a thing. I’m happy we spent almost 75% of our budget on hosting our family and friends for a party because it means we spent most of the money on our number 1 priority. I’m equally happy that line items like rings were under 2% of our budget, and that others don’t show up entirely, because that’s what allowed us to meet our number 3 priority: being debt-free at the end of it all. Would I have liked to have a Pinterest-perfect wedding with all the frills? Sure, but not as much as I loved the wedding we did have, that fit what we could afford to spend. And honestly, looking back on it, I couldn’t have asked for a better or more stress-free (priority number 2!) celebration.